What's the best castle in Scotland? Everyone who visits Scottish castles will have their own shortlist of favourites, and it's likely that no two lists will ever agree. But it seems reasonable to believe that a significant proportion of those who have visited Drum Castle would list it among their own contenders for the title of Scotland's best castle. As is obvious from the pictures on this page, Drum Castle does not benefit from a spectacular island or crag-top location. And neither did it ever play a truly pivotal role in the turbulent history of Scotland. But... if you are simply looking for somewhere that shows clearly the way that Scottish castles have evolved over the past thousand years you could do far worse than visit Drum. And if you are looking for a castle you could imagine yourself enjoying living in (however briefly, before you remember the running costs), then Drum would be very hard to better. 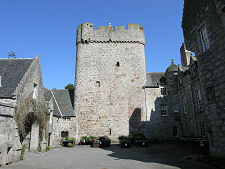 Drum Castle, plus its garden and surrounding 411 acre estate, lies on the north side of the A93 road some 10 miles west of Aberdeen and three miles west of Peterculter. Such has been the pace of development along the A93 in recent years that it's only a slight exaggeration to say that if you head towards Braemar from Aberdeen, Drum Castle and its estate marks the first true piece of open countryside you encounter to the north of the road. And such is the continuing pace of development in the area that's unlikely to remain even a slight exaggeration for much longer. But turn off the A93 and into the estate and you revert to another world far removed from the hustle and bustle of Aberdeen. The estate includes the 117 acre Old Wood of Drum, the last remnant of a once huge royal forest that spread for many miles along Deeside. 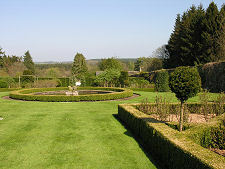 There are also areas of parkland and lawn, as well as a water garden developed in the 1930s to the north east of Drum Castle itself. 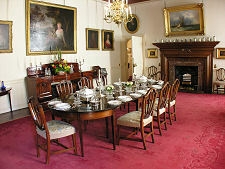 For those who like their nature more organised and ordered, the highlight of the Drum Estate is likely to be found in the walled garden, which has been developed into a Garden of Historic Roses, with its four quarters dedicated to rose gardens as they would have been maintained during each of the last four centuries. 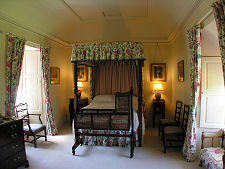 But this all overlooks Drum Castle itself, something few visitors will wish to do. 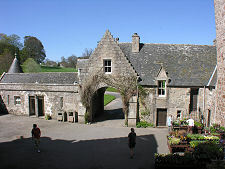 To reach the main car park you drive past the north side of the castle, and from there you follow a short footpath downhill to a gateway in the wall of the castle's courtyard. 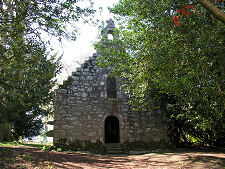 As you leave the car park, keep a lookout on your right for Drum Castle's chapel, built in the 1500s and restored to its current beauty in the 1800s. 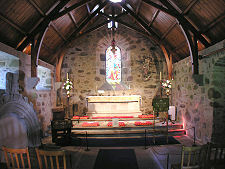 Today it stands among yew and holly trees and is one of the (many) reasons why Drum Castle is such a popular venue for weddings. One of the joys of a visit to Drum Castle is the sense of surprise and discovery you gain from exploring a building with so many twists and turns. It nonetheless helps if you start out with some idea of how the very different parts of the castle came about, and how they link together, sometimes in very unexpected ways. 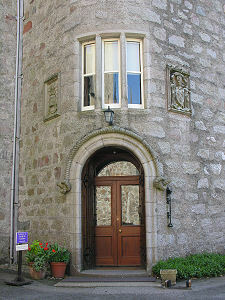 Drum Castle started life as the imposing tower house that today continues to dominate the east side of the castle. 70ft high and with walls that are 12ft thick at ground level, this was designed to be impregnable in an age before artillery. 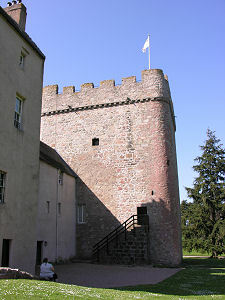 The walls taper as the tower climbs skywards, and it is thought that it was built in two phases, the lower part shortly after 1200, and the upper part in the years around 1300. Visitors tend to explore the tower after touring the rest of the house. 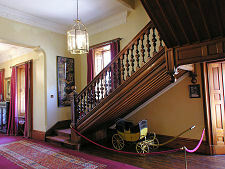 The entrance remains via an external staircase at first floor level. From there you can descend internally to the ground floor store rooms (unless rare bats are roosting) or climb to the magnificent upper hall, from which the agile can ascend further to the battlements. The observant might notice that the accessible areas of the tower leave unaccounted for a significant portion at about first floor level. We come back to this, literally, below. 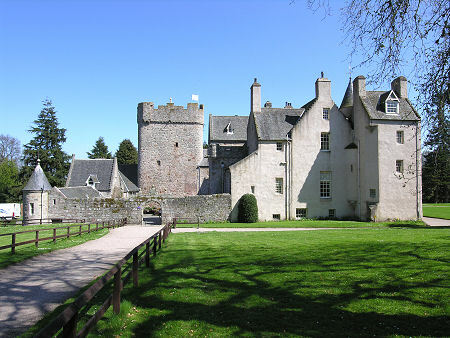 The rest of Drum Castle comprises the work of two very distinct eras which join together back-to-back. If you view the castle from the lawn to the south, what you see is a splendid Jacobean mansion built in 1619 by the then laird, Alexander Irvine and his wife Marion Douglas. The windows were enlarged and the central staircase and entrance were added in the 1700s, but essentially, by moving round to view the castle from the south rather than the east, you have moved forward over three centuries from a structure completed in around 1300 to one built in 1619. 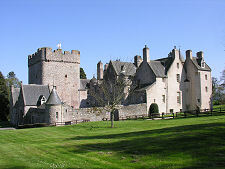 The most complex view of the castle is from the west, because from here you can see much of the original tower plus the west end of the 1619 mansion. And you also begin to get a sense of other parts of the building on the south side of the courtyard that don't seem to fit into either pattern. The mystery deepens if you view the south range of the castle from the courtyard. Logic suggests that you ought to be looking at the rear of the 1619 mansion. What you actually find yourself looking at is the front of a Victorian extension designed by the architect David Bryce and built by his nephew in 1876. The real joy of a visit to Drum Castle is discovering how the work of these three very different eras interacts to produce a truly fascinating building. The visitor begins in the ground floor entrance hall. 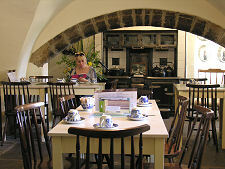 From here it is possible to access the service passage, which leads to the castle shop and tea room. 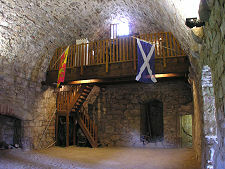 Alternatively, stairs lead upwards to the main floor of the castle. 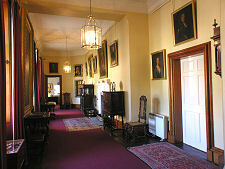 On its south side this comprises a series of grand rooms, with the drawing room leading into the dining room, and so on, along the length of the 1619 mansion. The division and function of the rooms have changed, but essentially you retain the sense of a series of rooms, each accessed from the previous one. 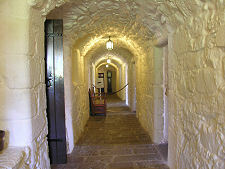 Turning the opposite way at the top of the stairs from the entrance hall gives a totally different impression of the castle, because this brings you into the gallery, a superb hallway running the length of the first floor overlooking the courtyard. 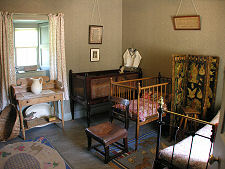 The gallery also gives access to all of the rooms on the south side of the first floor, and this was the main reason for the Victorian additions: to make the rooms in the 1619 mansion much more usable by removing the need to access them only from one another. At the east end of the main conjoined Jacobean/Victorian part of the castle, things get still more interesting. 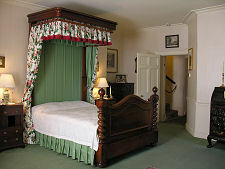 A turnpike stair gives access to further rooms, including the chinz room, a bedroom which benefits from windows on two sides, plus two rooms furnished as a day and a night nursery. 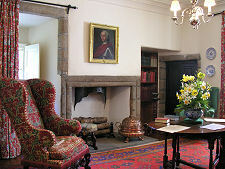 Back on the main floor of the castle, the cross chamber gives access to what we think is the finest room in Drum Castle, or any other Scottish Castle, come to that: the library. For those fond of mental maps, working out how the library fits into the overall structure of the castle is at first not easy. Then the realisation strikes. 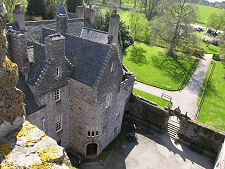 In the 1840s, before the addition of the Victorian parts of the castle, the laird had an internal connection made from the Jacobean mansion through to the main first floor level hall of the original tower house. 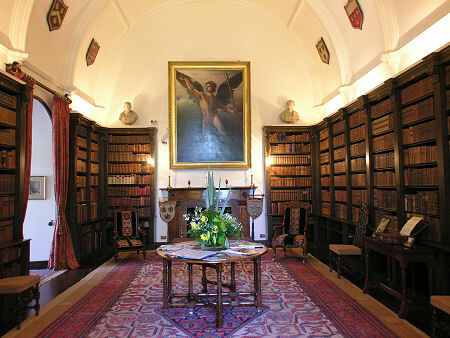 Suitably decorated and with a large window created in the enormously thick eastern wall of the room, what emerged was a magnificent library that is today home to over 3,000 volumes. Here is the reason for the "missing space" you find in the tower house. It is difficult to imagine a greater contrast than between the library at first floor level and the upper hall of the tower immediately above it, and in many ways this contrast sums up the development of Scotland's castles over the centuries. Anyone looking at the books on display in the library will be struck by the way in which they are ordered, which seems to owe little to the alphabet or to any obvious subject groupings. 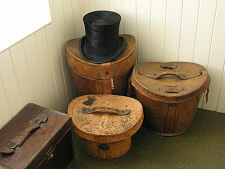 It was long thought that some more subtle cataloguing system used by the Irvine family was at work. 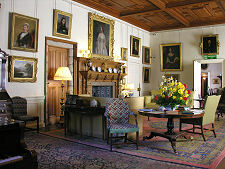 That was until a visitor revealed that he had been employed to decorate the library shortly before the Irvine family left Drum Castle in 1975, and that the ordering of the books was simply down to the arbitrary way they had been replaced on the shelves after the decoration had been completed. Perhaps one of the factors that makes Drum Castle such an attractive place is that almost everything that happened here was the work of just one family, the Irvines. In 1323 William de Irwyn (whose name possible derived from origins in Irvine in Ayrshire) was appointed by Robert the Bruce to oversee the Royal Forest of Drum and granted the Barony of Drum, plus the tower house you can still see today. Many generations of Irvines followed, with the heir usually being called Alexander. 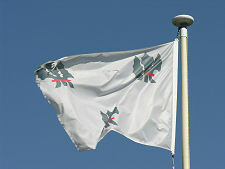 Drum saw conflict during the Civil Wars of the 1600s, being twice captured and four times garrisoned by hostile troops. Financial problems from the late 1600s led to the loss of much of the estate in 1736, though the family retained the castle and the immediately surrounding land. 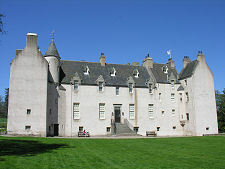 The Irvines also backed the losing side in both the 1715 and 1745 Jacobite uprisings, but despite this they bounced back and were able to develop Drum Castle further during the 1800s. Since 1975 Drum Castle and Estate have been in the care of the National Trust for Scotland, but the sense of visiting a real family home remains.